When you walk down the aisles of a tradeshow or festival, what do you notice? Chances are that you ignore more than what you see. Our eyes are naturally drawn to colourful and vibrant displays. It's a fact that many businesses don't take advantage of, but you're different. You know that the best way to attract attention is with an amazing display. We know the same thing! At EventDisplay.com.au, we make stunning products like our printed fitted table cloth to ensure your booth or the table is a standout. Your company deserves attention and we will make sure it happens. The more people who visit your table, the higher your potential revenue. Place an order with our team today or contact us for a quote. You may be surprised at just how affordable a custom table cloth can be. Designed to last, featuring double stitching and reinforced seems. We can manufacture these table cloths from any material you require however our 180d oxford material is an extremely tough, durable fabric which is washable and will stand up to commercial use. Full table cloths, 3 side table cloths, zip in panels for stowing items under your trestle. It can all be done, our range of table cloths are completely customisable to your requirements because each and every item is produced from scratch according to your requirements. All of our table coverings are printed in Italian colour lock inks, which are fade resistant and are guaranteed to faithfully reproduce your company colours and branding to a very very high standard. Most printed table cloths are designed to suite a 6 or 8 foot table. We can, if required produce a table cloth to suit any table size you require. 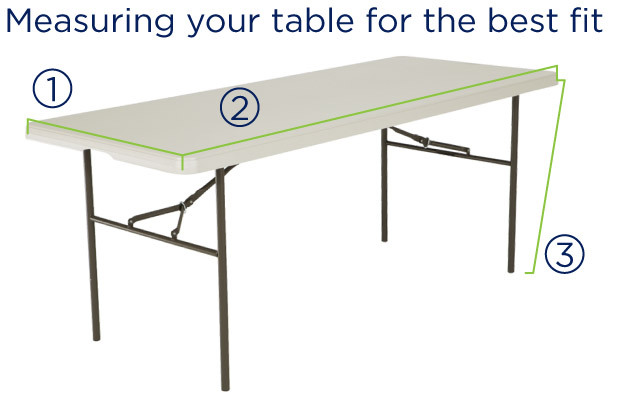 However our standard table cloth sizes are designed to suit most fold out trestle tables available from hardware stores and camping stores. If you do require a custom size table cloth then please see our measuring diagram below, or if you just want to be sure that your table cloth will fit then we always recommend measuring your table first. The height or drop of your table, please note our table cloths are designed to completely cover the legs of the table. So if you require a shorter drop or a custom drop please tell us your required dimensions.